The male staff on the Russia Beyond team talk about what March 8 means to them and the stress that goes into making the day perfect for all the women in their lives. Gleb Fedorov: "For us it's kind of like a family reunion, when the fact that we are all together is already something special"
In my family, March 8 was always regarded as a spring family holiday and yet another occasion for giving presents – never as something serious related to women’s rights and equality. Maybe this is due to the fact that my parents had very traditional occupations – military officer and schoolteacher – and so the question of the internal distribution of responsibilities in our family was never a problem. But now we actually do have a problem celebrating March 8, although it is a very pleasant one. With marriages and children, the men in our (now very big) family have became a tiny minority. So today it's such a big deal to find suitable presents for all the women that we have to start preparations immediately after the New Year. The second problem we have is finding a place to get together, since our family is scattered between Moscow, Petersburg, Minsk and Tver, as well as some other places. For us, there is no a special celebration for March 8 in particular. It’s kind of like a family reunion, when the fact that we are all together is already something special. 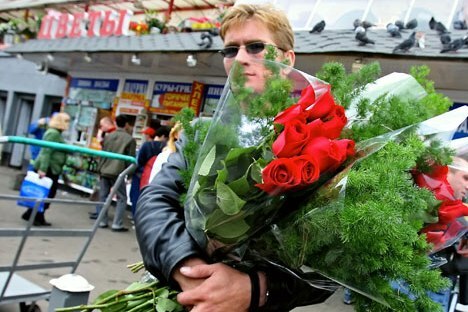 Vsevolod Pulya: "It’s only on March 8th that you see happy women in Russia everywhere"
Flowers. Presents. Smiles. You know the drill. Women in Russia are so used to getting flowers on March 8th that men don't have any other option but to meet these expectations. You may flood your significant other with bouquets and flowers during the other 364 days of the year, but if you forget about buying a "venik" (broom, that is) for her on March 8th, you're cursed, devastated, torn to pieces. Because, you know, everyone else GOT flowers. Even the not-so-good-looking wife of your neighbor, passing by with that look of superiority on her face. In a strange coincidence, flower sellers set their prices well above average on that day, which makes certain people become really creative at solving their problem of buying flowers. Once I had to drive 90 miles into the Moscow Region to find a flower farm with affordable prices. I bought “veniks” for my mother, grandmother, a girlfriend – and I even called some of my friends and offered to buy affordable bouquets for their gift-giving purposes, just to make my trip more wholesome. But, after all, that’s what girls want us to do all the time: travel to some wasteland, slay some dragons, get some flowers. March 8th in Russia is a holiday to celebrate this chivalry. They may say: I don’t need a reason to make my woman happy. Of course, you don’t. But it’s only on March 8th that you see happy women in Russia everywhere. Ilya Krol: "Maybe it’s also a day to draw another portrait for your mother, with a tender smile on her happy face"
It’s hard to believe that I’ve already survived 34 March 8ths. For at least half of these, the celebration of this day was completely focused on my mother. For many years, she was the only woman I considered beautiful and the only one to whom I gave flowers with love. My mother returned the feeling by keeping all my March 8 presents in a special archive and not tossing them into the trash can. In my mother’s archive are some dried roses as well as some other things, including a few portraits of her that I drew. The earliest one is dated March 8, 1985, when I was 5 years old. My mother looks very scared in it: Her eyes are wide open, her hair stands on end and is blazing, fear set on her lips. She is about to scream, like the man in the famous Edvard Munch painting. The second March 8 portrait was made two years later, in 1987. This time there is no fear; an expression of detachment is on her face. Mother's eyes are empty, her mouth is closed tensely, her haircut expresses a chaos that was tamed only with great effort. She's like one of Modigliani's inanimate models. The third portrait, made in 1989, depicts my mother in an absolutely different way: She's a calm, vivacious, self-confident person with a bright gaze and positive vision of the future – as if she had been drawn by Fernando Botero's powerful hand. Going through those images today, decades later, I see that they are not only about my mother. I see that these portraits express the evolution of every Russian woman who has lived in the most surprising, chaotic, unpredictable country I know, and who has experienced during her life a great scale of emotions - from fear and exhaustion to confidence and boldness. Wars, starvation, economic recessions, revolutions, passive laws and drunk Russian men have built the Russian Woman – a kind of phenomenon that doesn't exist anywhere else in the world. With her boundless ability to endure, deep comprehension, inexhaustible compassion and endless optimism, the Russian Woman is the most perfect and successful product Russia has ever made. And March 8 is just another cause to say to all the women of this country: “Thanks for coexisting with us.” Maybe it’s also a day to draw another portrait for your mother, with a tender smile on her happy face. Alastair Gill: "This is a day when the nation collectively offers its respect and gratitude to its women, who really are the rock on which Russia stands"
Russia is certainly not short on public holidays, and even those whose purpose is not really clear to many people (Russia Day, for example, on June 12) see posters, banners and bunting brought out onto the streets of cities and towns across the country. In the end, however, there are only a few that really count, and March 8 is probably the most important day of the year for many Russians after New Year’s Eve. It always strikes me that Women’s Day is an occasion when the whole of Russian society truly comes together – this is a day when the nation collectively offers its respect and gratitude to its women, who really are the rock on which Russia stands. And this is not an occasion - like Mother’s Day in the U.S. or the UK – on which some members of society are fêted while others are excluded: March 8 is a day on which all of Russian womanhood is exalted and thanked, no matter whether old or young, pretty or plain, married or unmarried, a mother or child-free. A celebration of girlhood, a declaration of love to a wife or girlfriend, an expression of thanks and goodwill toward colleagues or classmates, an acknowledgment of the special bond with a mother or grandmother – Women’s Day is all of these rolled into one. As for me personally, since I was not born in Russia and have no family here, March 8 for me has always been something more akin to Valentine’s Day. While a bouquet of flowers and a present is a must for the girl in my life if I am in a relationship, Women’s Day is also the perfect excuse to invite her around and employ my skills in the kitchen to treat her to a special meal – I’m a keen cook and there’s nothing I enjoy more than preparing an exotic three-course meal for two while she relaxes, then sharing it with a bottle of good wine.